You. Your Pet. Pet Partners. We care about the human-animal bond as much as you do. Join more than 10,000 volunteers nationwide who visit with their animals in facilities such as hospitals, assisted living, and schools. Why choose us for your volunteerism? You are in the driver’s seat: pick when, where, and how often you volunteer. Our program is inclusive – we register nine species for therapy animal work, not just dogs! When you become a Pet Partners team, you represent the best that therapy animal work has to offer. Pet Partners volunteers go the extra mile. 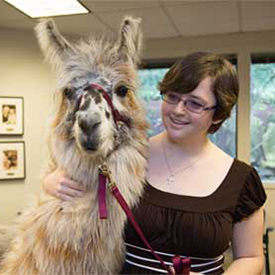 Volunteers receive comprehensive coursework taken in person or online that highlights skills and strategies necessary for therapy animal work. In particular, handlers focus on two important philosophies for success: YAYABA™ and PETS™. YAYABA™, or You Are Your Animal’s Best Advocate, is a cornerstone of our program. By putting their animal’s welfare first, our volunteers ensure that visits are enjoyable and safe for everyone. This approach keeps therapy animals coming back to work and play again and again! PETS™ stands for Presence, Eye Contact, Touch, and Speech. This acronym represents the basic tools handlers use both on duty and off to effectively communicate with and actively support their therapy animals. Practicing PETS™ is one way of practicing YAYABA™ – by reassuring, guiding, or praising their therapy animal, our volunteers foster a relationship based on trust and mutual respect with their therapy animal that allows them to provide safe and effective visits to over 3 million recipients annually. After they pass their course, our volunteers participate in an in-person evaluation that assesses their therapy animal teamwork (handler plus animal equals team) and the handler’s proficiency in understanding and demonstrating YAYABA™ and PETS™, as well as the animal’s sociability and aptitude for visiting people in different scenarios. Did you know… 96% of our volunteers would recommend our program to a friend? That’s the Pet Partners difference.